Dogs are social creatures, that's why they like jumping up, and it isn't surprising that your canine companion wants to greet your visitors just as much as you do. This isn't appropriate behavior for several reasons. Firstly, nobody wants doggie paw prints on their clothing. Secondly, a large dog such as an Alaskan Malamute or a Bernese Mountain Dog could easily knock down and injure a small child or elderly person. It's important that you teach your dog how to greet people appropriately, so he doesn't jump up on them for a cuddle. The most effective way to teach your dog not to jump up on people is to train him to do something else. An excellent alternative is to teach him to sit instead of jump. 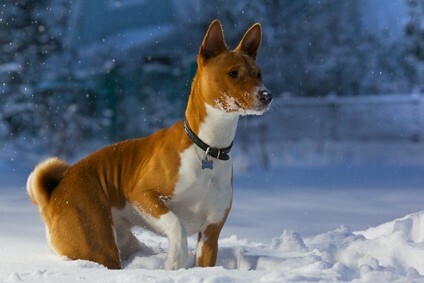 Start by making sure your dog will sit reliably on command. To train him to sit, hold a treat in front of his nose and move it upwards and backwards until his bottom hits the ground, while telling him to “sit”. Immediately give him the treat. Repeat this several times until he is quick to sit down when you ask him to. When he is reliable at sitting instead of jumping on you, it's time to challenge him by teaching him to sit when he meets other people. Ask a friend or family member to come to your door, armed with treats. When they come in and your dog looks like he is just about to jump, your friend should command him to “sit”. When he does so, he is given a treat. This should be repeated over and over again. It won't take long before your dog sits down when a visitor approaches, in anticipation of being given something tasty. The next step in your dog's training is to take him walking, so he can meet people in the street. Again, arrange for someone you know to meet you on your walk, and arm them with a pocket full of tasty snacks. You'll be able to tell when your dog is preparing to jump up on them, and they should immediately ask him to “sit” and reward him when he does as he is asked. This technique works very well because instead of just asking your dog to stop doing something and giving him no alternative, you are specifically teaching him an appropriate behavior which is rewarding for him. Don't be too surprised if he starts to sit down nicely next to anyone he meets. 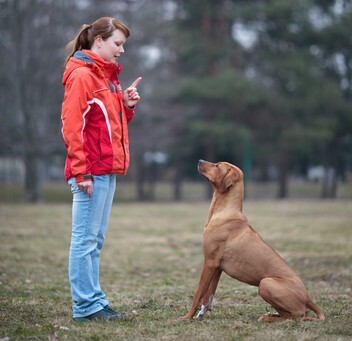 Teaching an alternative is a very good method for controlling any unwanted behaviors in your canine companion. There are a number of other ways of training your dog to stop jumping up on you and your friends. You may choose to ignore him and turn your back on him when he jumps up. Don't give him any attention when he is bouncing up on you. When he stops, you can reward him with a tasty treat for keeping his four paws on the ground. This works, but it can be a long slow process as you need to wait until your dog figures out that he isn't getting any attention for jumping, and decides to stop. It's not as terrible as it sounds, and you won't injure him. As your dog jumps you can just lift your leg so that he jumps into your bony joint. When he feels the knee in his chest, it's an instant punishment and he is likely to stop his annoying jumping behavior. The theory is good but it doesn't always work as expected. Many dogs continue to jump up in spite of a painful push in the chest. I don't recommend this method, after all, do you really want to hurt your dog to teach him manners? However some people do claim to get results with this technique. 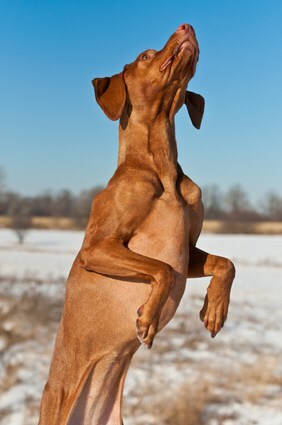 Could you physically push your dog down when he jumps up? Sure enough he will get down but you are paying him attention when he jumps. This means he will continue to do this behavior because there is something in it for him – attention from you. In your dog's eyes, any attention is good attention and will encourage him to repeat the behavior. Invest The Time to Stop the Jumping Up.. It's Worth It!! It's nice to own an affectionate dog that loves to jump up for cuddles, but it can very quickly become annoying, and even dangerous. You don't need to put up with this behavior; if you invest a little time and effort into training him, he will soon learn to be polite when he meets your friends and family. Next post: Why Your Dog Is Digging Up Your Garden… And How To Stop It. Previous post: Is Your Dog Depressed? Find out What You Can Do About It.